"Vaastu Shastra" the vedic architecture integrates the science of Ayurveda and Astrology by linking them with human lives. "Vaastu" Combines the earth's magnetic fields, the influence of planets and other celestial bodies along with cosmic rays and plays a vital role in happy family life and prosperity of business. Vastu Shilpa shastra, the ancient mystic science and art of designing and construction of buildings finds its origin Staptya Veda which in turn is part of Atharva Veda, one of the four vedas. It is the unending (Anantha) regions remote from the Earth, in which not only our Solar System but the entire Galaxy (Brahmaan) exists. It's effective forces are light, heat, gravitational force and waves, magnetic field and others. Its main chactreistic is Shabda (Sound). Atmosphere of the Earth which is about 400 kms, in depth and consists of Oxygen (Praan Vaayu), Nitrogen 78%, Carbon-di-Oxide, Helium, other kinds of gases, dust particles, humidity and vapor in certain proportion. Life of Human beings, plants and animals and even fire depends on this. Its main characteristics are Shabdaand Sparsha (Sound). Represents light and heat of fire (burning), lightning, volcanic or plutonic heat, the heat of fever or inflammation, energy, days and nights, seasons and such other aspects of Solar system, and also enthusiasm, ardor, passion, spirited vigor. It's main characteristics are Shabda, Sparsha and Roopa (form). Earth the third planet in order form the Sun, is a big magnet with north an south poles as centers of attractions. Its magnetic field and gravitational force has telling effects on everything on Earth whether living or non-living. 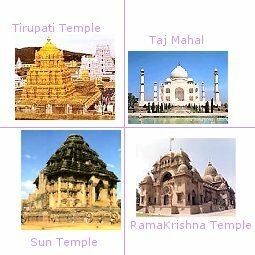 It is tilted by about 23½° at the meridian of its either side for six months called Uttaraayana and Dakshinaayana and rotates on its own axis from West to East resulting in day and night. Its one orbit around sun takes 365 ¼ days (1- year). Three fourths of Earth's surface is water and one fourth is land. Its main characteristics are Shabda, Sparsha, Roopa, Rasa, and Guna (quality). Sun Temple at Konarka, Orissa, India. Prashanti Nilyam, the Ashram of Shri Saibaba of Puttaparthi. Shri Ram temple at Bhadrachalam, Andhra Pradesh, India. The temple of Lord Sri Venkateshwara at Tirupati, India. Lord Visweshwara temple at Benaras. Shri Varda Raja Temple, Kanchi. Temple of Kanaka Durga, Vijaywada. Temple of Goddess Annapurna, Benaras. Vivekananda Rock Memorial, Cape Camorin. Tamil Nadu Brick Plant, Chamarambakkam. Cafe of Kerala at Benaras.